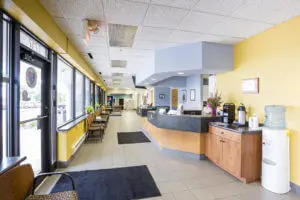 Our 24 hour pet hospital is located in Eden Prairie and serves Minneapolis and St. Paul. Because of our advanced care, we also draw patients from all over Minnesota, as well as North Dakota, South Dakota, Wisconsin and Iowa. Emergency: Call ahead to your BluePearl emergency vet and let us know you’re coming. No appointment is necessary for our emergency vet. Learn more about your emergency visit. Referral Care: Our veterinary specialists work directly with your primary care vet to understand your pet’s condition and develop the appropriate treatment plan. Visits to our specialists are usually by referral from your primary care vet and by appointment. Learn more about veterinary specialists. 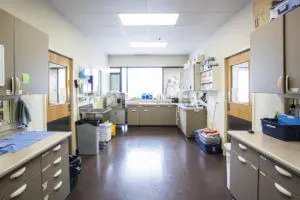 Our fully equipped hospital features friendly, considerate staff, expert veterinarians, and state-of-the-art technology, including an MRI and a CT scanner. Our vets collaborate closely with each other – and with your family veterinarian – so we can provide the best possible care for your pet. The BluePearl pet hospital in Eden Prairie was previously named Affiliated Emergency Veterinary Services. We are open 24 hours a day, seven days a week.